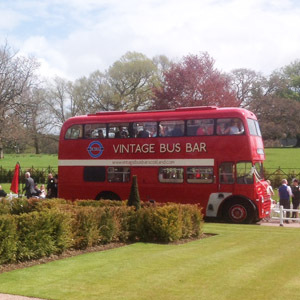 The Thistle Vintage Bus Bar! A unique and fully functioning bar in a refurbished vintage double decker bus. 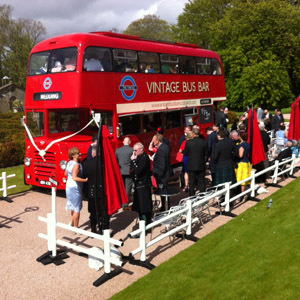 Whatever event you are hosting the Thistle Vintage Bus Bar is sure to be a talking point! 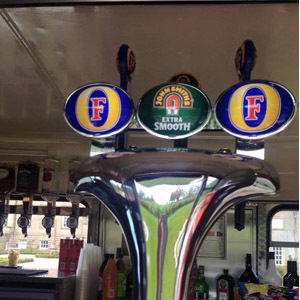 We are delighted that our Vintage Bus Bar offers, fully chilled products on tap, supplied and installed by Heineken UK– Foster’s Lager, John Smiths and Strongbow Cider. A full range of spirits, premixed drinks and packaged beers come as standard on the Bus Bar – Special Menu offers are easy too – if you want a Champagne or Whisky Bus Bar? We simply stock it to your requirements. The Thistle Vintage Bus Bar has full refrigeration on- board, in addition, a refrigerated trailer ensures that the fridges on our bus are restocked with drinks that are already cooled. This Vintage Bus is in full working order, however, it is not a party bus – it becomes a bar when stationary .